A 35-acre raw water reservoir at the Franklin Water Treatment Plant in Tennessee uses XR-3PW and XR-5PW to line its basin. 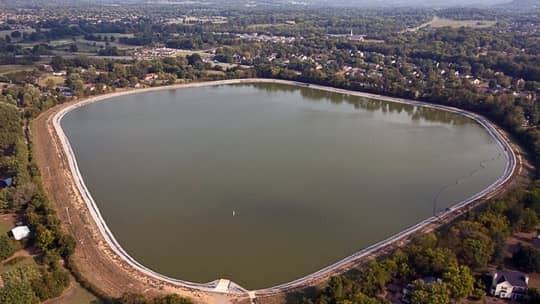 The City of Franklin, located just outside of Nashville, Tennessee, selected Seaman Corporation's potable water grade XR geomembrane fabrics to line its 35-acre raw water storage reservoir. The raw water reservoir is the sole source of water for the existing 2.0 MGD water treatment facility located on an adjacent site. All of the water treated by this plant comes from the Harpeth River. Normal operation is to pump water from the river to the reservoir; the plant then pumps it from the reservoir into the treatment facility. The City of Franklin relies on this water as its emergency supply of drinking water when primary sources run low. The project was part of a rehabilitation effort to fix leaks in the reservoir caused by several deep fissures in the reservoir's earthen basin. Because of these leaks, two years ago when the city experienced a drought, the reservoir ran dry. When the Tennessee government released economic stimulus dollars, this site was among the top 10 projects earmarked to receive funding. After a failed attempt to use a natural clay liner, the city selected a potable water grade reinforced geomembrane fabric liner by Seaman Corporation to solve its water containment issues. Ninety percent of the reservoir, primarily the basin, is lined with the company's XR®-3PW product. Seaman Corporation's brand new XR®-5PW product, which is specially formulated with extra weather resistance characteristics, lines the side slopes of the reservoir. The company recommended this design because the slopes will experience greater exposure to the elements. Both fabrics are highly engineered with excellent tensile strength and puncture resistance. These qualities were particularly important to the city which has plans to expand this facility and the impoundment in a future growth effort. AECOM, the engineer for the project, specified Seaman Corporation's PW products for the job. Colorado Lining fabricated the panels in their Houston based plant and Geosynthetics Incorporated (GSI) installed the 1.3 million square foot liner to cover the reservoir's base and side slopes. The project goes on record as one of Seaman Corporation's top 10 largest geomembrane projects ever and as the largest installation using the company's NSF 61 approved potable water fabrics.